Wiki Loves Art in Malta is a fluid set of activities that constitute on of the two main content development and editing activities for Wikimedia Community Malta. The first iteration of Wiki Love Art in Malta was produced in collaboration with the Gabriel Caruana Foundation in 2017. This also included a public discussion on Documenting Maltese heritage through Wikipedia, produced with the Department of Information and Archive Science at the University of Malta. Around the start of 2018, WCM were approached by Blitz to participate in the Art & Feminism project. We immediately developed the idea for this activity to form part of on-going initiatives around Wiki Loves Art, particularly relating to the documentation of the Fondazzjoni Kreattività art collection, coordinated by the M3P Foundation. A number of sessions relating to creating and editing pages on Wikipedia and the M3P wiki about visual arts in Malta will be held within the Wiki Loves Art programme during February and March 2018. A public discussion about Wiki Loves Art which introduces the mechanics of the wiki platform and its value as a way to document visual arts in Malta will take place on 15 February, followed by two focused edit-a-thon sessions in March that will guide contributors to take a hands-on approach to editing wiki pages relating to the visual arts. During this period, an exhibition of artworks that form part of a related research project at Spazju Kreattiv was held at St James Cavalier in Valletta. Art+Feminism is an international project aimed at improving Wikipedia content on women and the arts and to encourage women’s participation in the online encyclopaedia. Flora Katz – a curator, art critic and organiser of three wiki edit-a-thons in Paris – will present a talk on the 2017 Paris edition and discuss some of the issues at the core of the project, such as how art and Wikipedia can be a driving force to gather a community and act upon feminist issues, and what is at stake in the elaboration of an activist and co-creative project within artistic institutions. During the opening day of the "Art from the Fondazzjoni Kreattività Collection: Documenting 2007-2012" exhibition, Spazju Kreattiv will host a workshop on editing Wikipedia. The workshop will also include an information session on how Wikipedia and wiki technology are being used to document the art scene in Malta. In collaboration with Wikimedia Community Malta and the M3P Foundation, Dr Toni Sant will explain how wikis are being used to catalogue art works and exhibitions, and how Wikipedia can act as a collaborative encyclopaedia of artist biographies and works that will preserve their legacies in the long term. Alexandra Angeletaki of the Norwegian University of Science and Technology discusses the challenges of integrating VR and mobile technology tools in disseminating archival material, and whether its introduction has led to a change in the experience of the contemporary museum-archive. Using the case of the University Library's Mubil and ARK4 projects, she explores how 3D technology workshops, gaming and mobile technology were used in the Mubil lab in order to develop open access educational workshops for university students and schools with source material drawn from archives and museum objects; and how the ARK4 project focuses on archaeological context, experimenting with user interactivity, digital technologies and gaming. 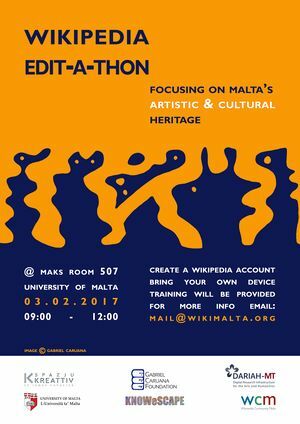 This hands-on wiki edit-a-thon, led by Toni Sant and other collaborators from Wikimedia Community Malta and the M3P Foundation, guides attendees about how to edit wiki pages about the visual arts scene in Malta. We are particularly eager for artists to attend, edit pages about themselves, their work and their exhibitions over the years. We also encourage you to bring along any printed or digital media files that would help document art works, such as copies of exhibition flyers, photographs of events, etc. Please also bring a laptop computer or tablet device. As part of the Art+Feminism project, Blitz hosted a wiki edit-a-thon across two days to bring together people who are interested in learning how to edit Wikipedia to create new articles and improve existing content about women and the arts. This hands-on event was facilitated by Wikimedia Community Malta and the M3P Foundation, in collaboration with Spazju Kreattiv. This exhibition is an integral part of a research project which commenced in January 2016 to compile a detailed catalogue of the Fondazzjoni Kreattività Art Collection, currently stored at St James Cavalier. The previous display of work from this project occurred in 2017, featuring works that were originally exhibited at St James Cavalier between 2000 and 2006. This time artwork dating from the period 2007 to 2012 are being displayed. Apart from exhibiting the actual works of art, the project identifies and documents important elements that remain after a creative project has been exhibited to the public: proposals, press releases, artist profiles, photos, reviews, posters, videos, and other material can provide an indication of the significant context in which the works of art were originally presented. This material can also help researchers better understand the artwork itself, as well as the work of the artist in a broader cultural spectrum. This ongoing project makes use of workshops and open discussions to help document the works of art held in Fondazzjoni Kreattività’s collection, as well as to document the contemporary Maltese visual arts scene more broadly. This project is set to be completed in 2020 as part of the Fondazzjoni Kreattività’s 20th Anniversary celebrations. This discussion focussed on thinking about how organisations and interested citizens can bring more attention to Maltese heritage, culture and art through its documentation on Wikipedia, and how to incorporate such practices into their ongoing work and into the national digital cultural strategies. The debate brought together highly-experienced international Wikimedians and local policy makers and cultural professionals. The discussion addressed a real gap in the cultural sector for guidance on institutional strategies related to engagement with the citizens, and discussed how to effectively direct limited resources towards engagement of communities in the digital space. The discussion was chaired by Professor Seamus Ross (University of Toronto). See also: Facebook event page here. In collaboration with the Gabriel Caruana Foundation. Registration here.